I hope everyone had a wonderful holiday! I took most of last week off here, just posting Frankenstein’s Monster on Weeble Wednesday, and otherwise relaxing and taking care of end-of-year things. One of the things I did was watch one of my Christmas presents over and over, that being the new BBC series Sherlock. I really love the dialogue, and all the little references to the original Holmes, and the wonderful rapport between the two main actors. Also, I have a desperate, hopeless lust for the coat Sherlock wears — it’s everything I’ve longed for in a coat, except that it’s wool, so I couldn’t wear it even if I could afford one (it’s a very pricey designer brand from Britain, and last year’s line on top of that). 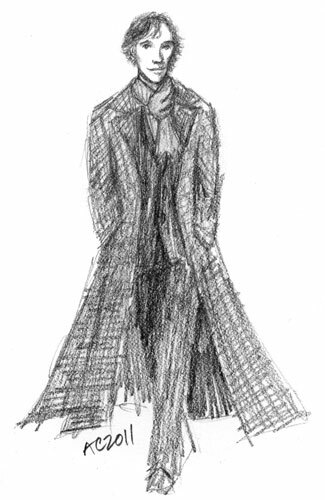 In honour of my newest fangirlish obsession, my first post of the new year is Sherlock Holmes, as re-imagined by the BBC in modern times. It’s not perfect, but it’s a good start — I’m sure I’ll do at least one or two more, and a couple of Dr. Watson as well. I have some Moleskines lying around that could be easily Holmes-ified. Also coming up for the new year is another coloring book (with all-new art that’s very nearly done), weeble monster Valentines, the opportunity to be a Zombie, and a window full of art up in a local book shop for the month of February. Happy New Year! What are you all up to for 2011? Beautiful sketch. Very attractive. I might have to get that series. And I see what you mean about the coat. Thanks! I’m really enjoying the series, I think Amazon has it for a reasonable price. I can’t wait for series 2 to start!